A magnificent event took place as NASA captured the final moments of a dying star. The Hubble Space Telescope was able to capture a breathtaking image for NASA and ESA. The image shows the last dying moments of star, in the Lagoon Nebula of the Sagittarius constellations. The Lagoon Nebula is one of the most spectacular and brightest nebulae in the universe. The name of Lagoon Nebula was given because of the lagoon’s shaped lane of dust which crosses over the nebula’s glowing gas. It is also known as Messier 8 and it is approximately 5 thousand light years away from Earth. The Lagoon Nebula is known to be in the direction of the Sagittarius constellation. It was first documented in the year 1654, by the Italian astronomer Giovanni Batista Hodiera. It was considered, at that time, to be an object of an intermediate level of brightness. Only in 1680 it was categorized a nebula, by John Flamsteed, a British astronomer. Herschel 36, being the middle hot star, ionizes the radiation surrounding the biggest region of the nebula, known as the Hourglass. 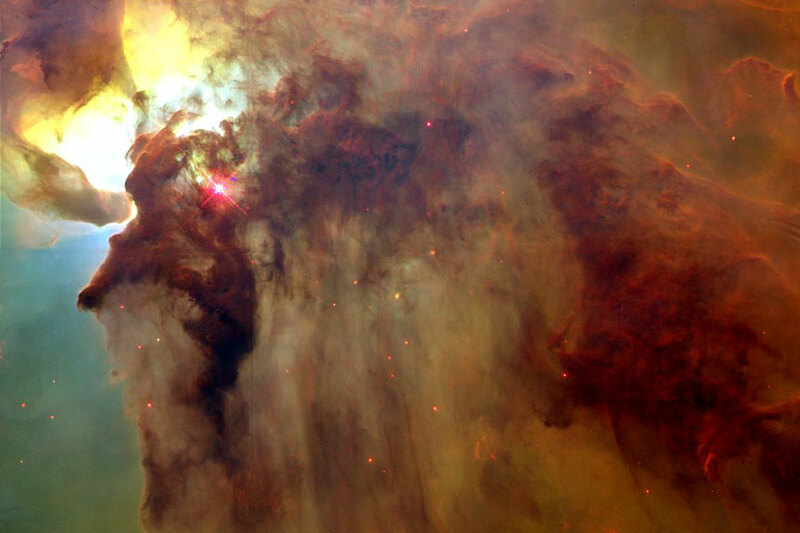 The star represents the main source the ionizing radiation that happen in this particular area of the Lagoon Nebula. The Lagoon Nebula presents a thin twist between two important structures of gas and dust. It is a phenomenon similar to Earth’s tornadoes. The event is caused by huge differences between the hot temperature at the surface and the cold interior of the clouds. In a combination with the pressure of starlight, the clouds are turned into the form of a tornado. The other hot starts that are present in the nebula ionize the outer parts that are visible in the nebulous material. The fascinating colors that surround a dying star are a result of the explosion of a low-mass star into a planetary nebula. The light spectacle is made by the cloud of gas that is released by the dying star and the radiation in the surroundings. The usual life spam of a planetary nebula is around 10.000 years. After that, the central star looses it’s heat and slowly turns white, eventually fading from view.